** this song replaced "Life's A Funny Proposition After All" in subsequent revivals of the play. 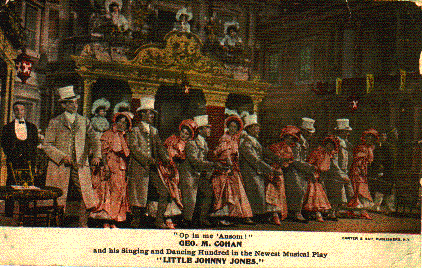 A postcard depicting the musical number "Op In Me 'Ansom!" A mock-up of the Cecil Hotel in London was used for the set of Act I.
good-natured comedian who has made a reputation in vaudeville, made a hit." the fold. Father and mother are still with the show and so is Ethel Levey, who is Mrs.
before last, as well as to many of the previous attractions of marked artistic merit. public. It must be treated seriously. former skill, and her male impersonation is excellent. Jerry J. Cohan, and Helen F.
he and the chorus girls are the really attractive features of "Little Johnny Jones." surprise. And he seemed to be just as surprised as I was when I told him I was broke. 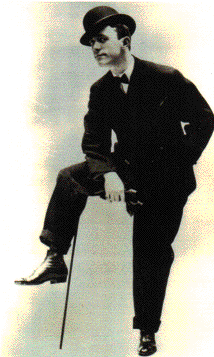 Still From "Little Johnny Jones"
far too busy to get down to actual writing until about ten days before rehearsal call." old-fashioned comedy melodrama "all dressed up" in songs and dances. popular melodrama, after witnessing my dress rehearsal. That was the only argument I had to offer. possibly one of the biggest in the history of American musical comedy. well convinced that New York would have none of it. fancy premiums just the same. It was the one and only Broadway "comeback"
I have ever known or heard of. kindly to my personal performance of the title role. theaters,' was the opinion of one of New York's foremost dramatic experts. were "tin-pan tunes," according to the musicianly highbrows. 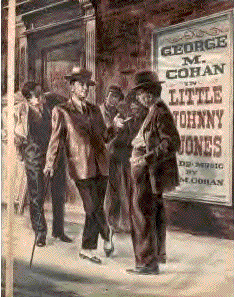 Purposefully, the character of Johnny Jones, was not given too much time on the stage. audience's mind. Cohan's shrewdness over his role paid off. been another stage figure who combined these abilities." 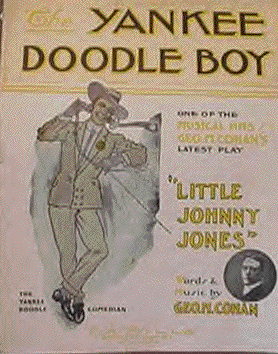 "Little Johnny Jones" featured three classic Cohan songs: "The Yankee Doodle Boy,"
"Give My Regards To Broadway," & "Life's A Very Funny Proposition After All." all three songs is preserved. 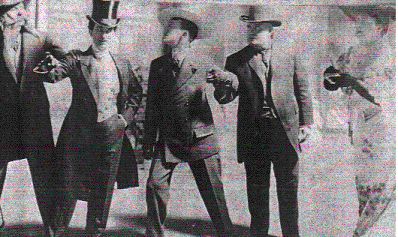 the stills from the original production. at least not until 1910.
the second wife of George M. and Alice would later marry Sam Harris. teach them the discipline - but if he could hit .300 or better, that was an asset. the site of Cohan's last Broadway musical comedy performance "I'd Rather Be Right").